As some of you know, I was planning to homeschool my kids at one point. That didn’t really pan out but I do take the boys educations very seriously and do what I can to supplement the education they get or will be getting from the public school they attend. Part of that is making sure they don’t loose everything they’ve learned over the summer. Logan’s teachers were great about sending things home for him to do over the summer and I signed him up for free tutoring through a program he’s in to get extra attention with reading and math skills. To help keep him in the school mindset I also bought one dollar workbooks for him and Lucian to work on after lunch. After Logan’s first tutoring session I have been told that he will not have any trouble in first grade! Parenting win! The takeaway here is that even if your kids attend a public school, their education is your responsibility. I am so lucky to be able to stay home with my boys and I know not everyone has this opportunity. Even with busy schedules, there are small things you can do to keep your kids on track. Reading them is a big one. If you work third shift and aren’t home at bedtime, read to them whenever it works for you. I assure you they don’t care if it’s a bedtime or middle of the day story. You can also buy these workbooks and assign them pages to do while you’re at work. You can grade them and go over it in the minutes you have to spend with them. Hope you and your family are having an excellent summer vacation! Today, the first of the new year, while we are in the city running errands, grocery shopping and the like. I am going to ask to make an extra stop. I am going to stare at temptation and only buy one book! Hey everyone! I have had my juicer for over a week and while I was unable to start a fast or reboot because of timing issues, I have been juicing every day and started replacing some meals with juice, I still lost six pounds!! I am beyond excited since I had ten pounds of baby weight from Lucian that I just could not shake. Also, I have that stubborn belly fat pouch thing which is shrinking. There are a few things that you should know about juicers. A juicer should go no faster than 80 rpms. A slow juicer. The reason is because when the juicer speeds up beyond 80 rpms it begins to heat up your juice which destroys the micro nutrients and defeats the purpose of juicing. The one I bought is one of the more expensive ones so let me tell you why we chose it. First of all my Juice Mentor, Sifu Sarah, has had hers for about two years give or take a couple of months, juicing every day and it is still going strong. Finding products that last today is harder than finding a needle in a haystack so I immediately knew I wanted to go with that brand at the very least. Looking at the Omega juicers there were a few options. The least expensive was the VRT 330. We did not choose this one because it is made for juicing every few days and during the fast we will be juicing every day a couple of times a day. Once you cut and juice your veggies and fruit they again will begin to lose those micro nutrients which are so important. So you need to drink your juice as soon as possible after making it. So for fasting the Omega VRT 350 was a better choice. I also plan to drink juice as a regular part of my diet once the fast is over. On days when I am working I will have no choice but to juice my breakfast the night before. I can’t really be running the juicer at 4am with two kids sleeping right above my head. Unless I want a grumpy husband when I get home. The idea here is to give you the most information so that you can make the best decisions for you and your family. For a less expensive option on a juicer, there is the Hamilton Beach 67601A. My mom bought this juicer for a beginner model. The juicer cost is significantly lower than the Omega unfortunately it does not give you the rpms. However, it is 800 watts while the big ones that go 1200 or more rpms are closer to 1000 watts so it is still a better choice. I know this is the direction that is best for me and my family that is why I spent the extra money and got the one I did. I have been doing a lot of research on juicing from watching documentaries to reading books and talking to people who already do it. Don’t feel like you need to run out and buy the most expensive juicer you can find to get a good one. Some of the crazy expensive ones are way too fast. Reaching speeds of 13,000 rpms. No that is not a typo. Starting small is just fine and probably better for more people. Happy Juicer hunting! I am here if you have any questions or concerns. Feel free to comment. About two years ago my Kung Fu Instructor, Sifu Sarah, told me that she was using juicing to treat her husbands cancer. During our conversation I was amazed at the power of juice and thought, well that’s good to know if I ever get sick. Her daughter told me to watch Forks Over Knives, available on Netflix instant, and I thought, sure I will but later. I was not ready to get rid of my hamburgers just yet. Fast forward a year and I had started to think more seriously about food mostly because as the main meal maker for my growing family it was my responsibility to keep us healthy. So as I was scrolling through my instant queue one rainy day looking for a movie I saw Forks Over Knives, and thought Ok, why not? What’s the worst that can happen? I am a science minded individual so that documentary really hit me where I live. Briefly let’s step back into my childhood. I was raised on a small farm in rural New Hampshire. We had pigs, cows, chickens and a moody horse named Captain. We ate the male cows and we milked the females. My father just recently told me he used to order twenty-five chickens each year and once they were grown we would have a rooster for dinner every week until their were only hens left, from which we got our eggs. When my parents divorced, I was five-ish, we got rid of the animals. Anyway I was and am ok with killing animals for food, just don’t ask me to do it. I would rather not eat them at all but if you want to I won’t hold it against you. That being said, I watched the movie and I was mortified. I had been lied to. We all had. The experiments that these two men were doing, unknown to each other, had the same results. The animal protein we had been trained was our best source of protein was in fact killing us. The cause of many cancers and heart disease. However, I still didn’t know how to make a change. I did not know how to cook vegetables. I knew how to cook meat and I was good at it. Also, there was no way my husband was giving up his beloved steak tips. So I made a conscious decision to make more veggies and less meat and starch but that was as far as it went. I also am still on the fence about cutting meat out entirely. I am still pretty much thinking “If one of us gets sick” Although after watching Food Inc., and hearing a mother talk about her little boy dying slowly over the course of mear weeks because of a contaminated hamburger, I have definitely rethought the big meat company route. Fast forward another year and Sifu Sarah brings up juicing again. This time the juicer cost and the cost of the fruits and vegetables are what are in my way. About a week later my sister calls me up and says “We got a juicer! You should come over and have some fresh juice sometime!” So I did. It was amazing. So fresh and just delicious. So I asked what was in it, naturally. There were at least three vegetables I absolutely despise in it. So I went back to Sarah and we talked in length about what is necessary in a juicer. I then looked them up online and began to research juicing in general. That is when I stumbled across Joe Cross and his movie Fat, Sick and Nearly Dead (also available on Neflix). In which Joe embarks on a journey to get control of his body and off prescription drugs by going on a 60 day juice fast. The results are amazing and inspiring. After the movie I was decided. I would do a ten-day juice fast, which Joe called, a reboot, and much to my surprise and happiness, my husband will be joining me. That means that we will be eating nothing but juiced vegetables for ten days. Maybe longer if we feel we need to once we reach the ten-day goal. I will also be drinking water because I think we need just plain old water sometimes. This is a detox that we have been in need of for quite some time. My motivation is the fact that I cannot remember a time in my entire life when I woke up feeling rested. No matter how much sleep I get, I am still tired. I thought I might have lyme disease last year because I had joint pain and I was so tired. Just exhausted and I am sick of it. The tests came back negative. I am also desperate to be able to think without bursting a blood vessel. Unfortunately I am only slightly exaggerating. When I speak there are more Uh’s and Uhm’s in it than actual words and its driving me crazy. Mike’s motivation is trying to fit into his dress blues for Memorial Day. I will keep you updated on our progress and please remember if you are going to embark on a fast you should always consult your doctor especially if you are on prescription medications. Maybe you think I am crazy, maybe I am. Either way I need a change and I can’t wait around for someone to tell me what’s wrong because my tests always come back normal and I don’t want todays band-aid solutions of some medicine that barely treats the side effects and causes more problems that the disease itself. My juicer should arrive on Wednesday of this week. Mike is starting his fast on Thursday and I will start mine Friday afternoon when I get home from work. My understanding is the first three days are the hardest so I will be blogging about it each of those first few days. I want to try and vlog too so we shall see about that. Here are a few links if you would like to check out what I have learned. If you are health driven I recommend Fat, Sick and Nearly dead. If you are science driven, Forks Over Knives. And if you are morally driven I suggest Food Inc, but have a tissue ready. My Best Bud Sara and I will be making our first book club video this evening on Google Hangouts! The page is called Judging By The Cover as that is how we choose books. Tonights discussion is on Veronica Roth’s Divergent!! I cannot wait to hear what Sara thought!. I will be posting the link later I hope you all head over and find the page ahead of time though. The photo is old book pages. 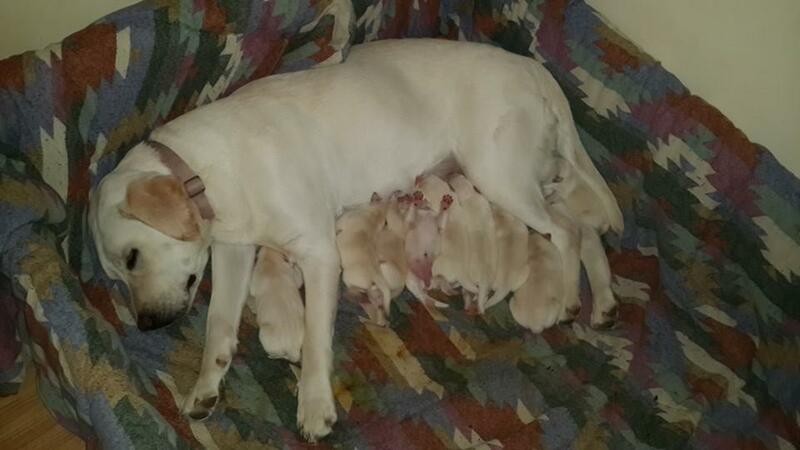 So, about three weeks ago I noticed Ruby, our yellow lab, looked a little rounder than normal. She is a very lean dog so when she was suddenly round, it caused me to raise a brow. My husband took her to the vet who reported, he was sixty percent sure she was in fact pregnant but he could tell us for sure next month. He also said a lot of dogs have false pregnancies with their first heat so I thought ok we will know one way or another next month. Non-the-less I kept poking her belly trying to feel pups and about a week after the vet visit I was successful. Knowing she was in fact expecting I planned to build a welling box and get her settled in. Based on what I had read I had maybe two weeks to be ready. Meanwhile in the back of my mind I keep thinking it will be any day. I never trust my instincts. Anyway, last Saturday February 15th, I woke up at 215am for work as per usual and Ruby pranced around when i turned on the light as usual but something was different. She had not eaten her dinner. I had read that dogs will not eat within twenty-four hours of giving birth, you would think this would be a significant clue however, sometimes she just doesn’t eat so I didn’t think much of it. I fed her a milk bone and as I got into the car I thought, Mike is going to call me saying she in labor. Shrugged the thought off and headed out. I had been at work for a little over an hour when Mike called me. “We have three puppies so far.” Is what he said. So I hopped back into my car and raced home. I am writing this for multiple reasons. 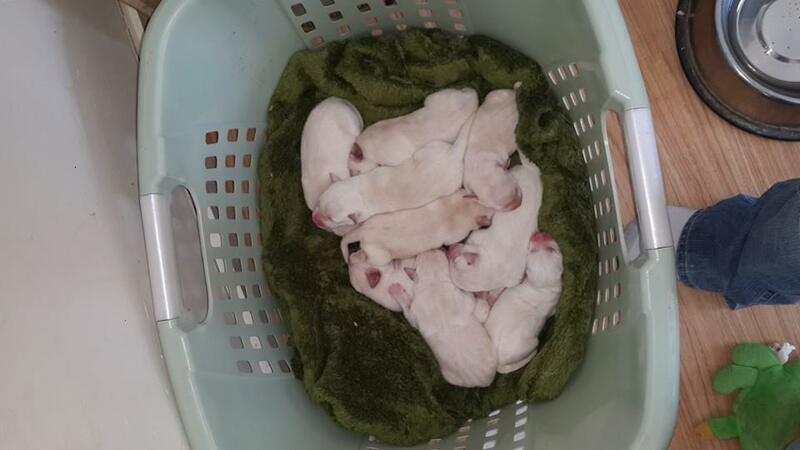 One being its a cute story that ends happily with nine puppies, but I know how this could have gone and honestly I had been expecting the worst so I thought I would share some information that would have been helpful to me about a week ago. First, it’s tough to tell when your dog is in heat but research is your friend. If you don’t get your female fixed pay attention. We had no idea for the first half of Ruby’s heat because she was so good at cleaning up after herself. Talk to your vet and remain vigilant. We were EXTREMELY lucky that things turned out well for us. 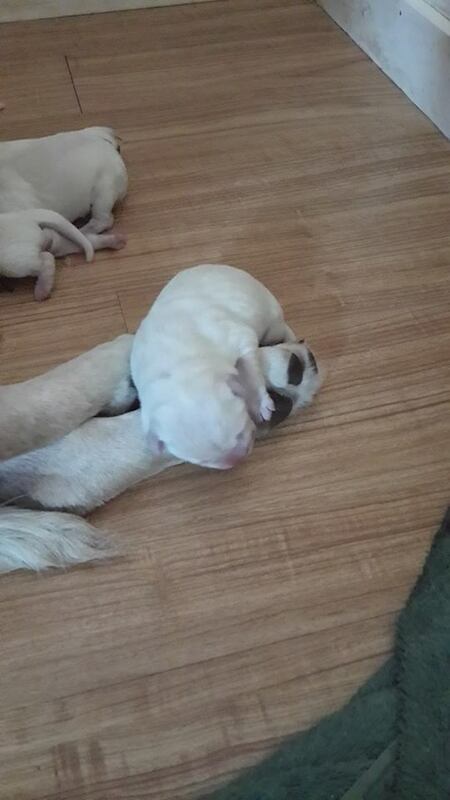 and Ruby took to being a mother. She is still a puppy herself after all. Second, lots of things can go wrong with young mothers. They can neglect their young, they can kill their babies, sometimes they just don’t know what to do and the babies die because the mothers don’t clean them off and get them breathing. 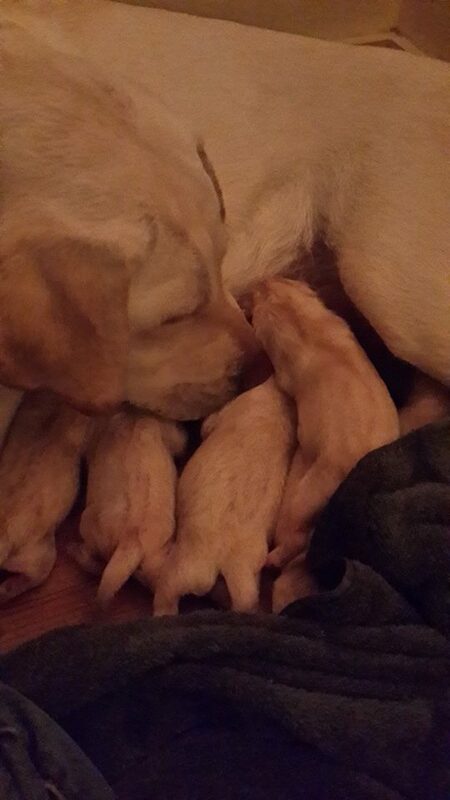 Honestly I was expecting to lose puppies, but Ruby took to motherhood very well. I did have to warm the pups and set them up for their first drink which is very important. There were four at this point and as it turned out five to go. In situations like this you should have thread, scissors, and a suction bulb like you use for babies noses. If your dog does not clean the babies you need to break the amniotic sac clean out their mouths and cut the cord and then rub them off with towels till they cry out and then put them right on the teat. You also need to keep the puppies warm. Their number one reason for fussing is because they are cold. If they are on a teat and still crying they may need to eliminate urine or a bowel. I was lucky that Ruby reacted as a mother dog should and I was lucky to have had a grandmother who taught me a lot about dogs and let me help as a collie birthed a litter once (I was like ten). So, when Ruby had trouble with baby number eight I knew what to do. The amniotic sac had broken before he was born so when she pushed his head popped out and when she stopped his head slipped back in. Poor Ruby panicked momentarily when she couldn’t find him. 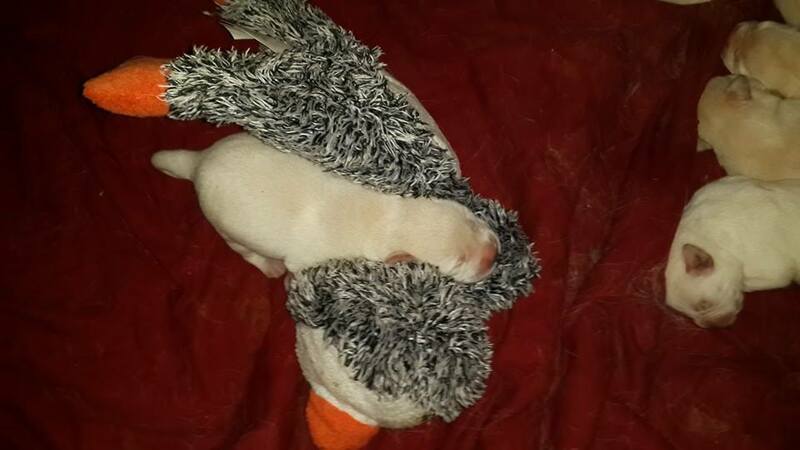 When she pushed the second time I slipped my fingers behind his jaw and waited for the third push and gently guided him out, then it was a lot like that scene in 101 Dalmatians when the guys has the puppy in the blanket and he in rubbing it trying to get it breath. Of course, this pup did not squeal like the rest he just eventually gave a heavy sigh which was good enough for Ruby and I. If you need a safe place to keep pups in a pinch a laundry basket with a blanket works great! Once all nine were out and it was a reasonable hour, I gave my gram, Mimi, a call. She told me I needed to call the vet and see if we could get an x-ray, the biggest danger at this point was that there could be a pup stuck in her still. I had no idea this could even be an issue, I am so happy I thought to call her! Two x-rays later we were in the clear. 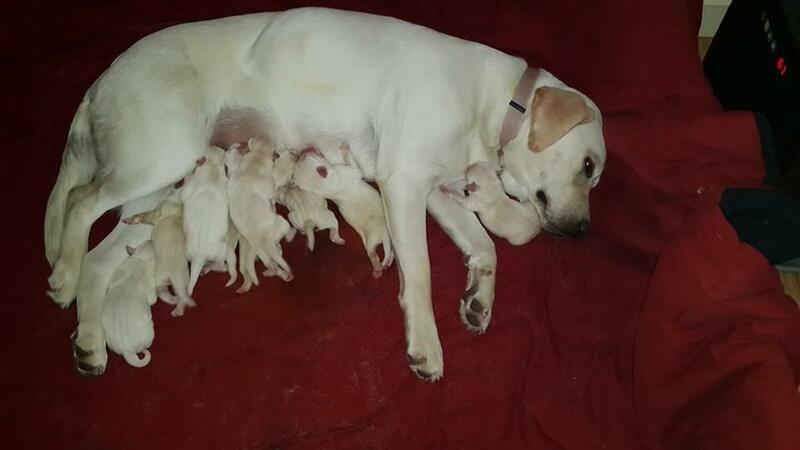 I went home and over the next few hours noticed Ruby was not cleaning the pups properly. She was licking them to help them go to the bathroom (Puppies can’t eliminate without help) So I called Mimi once again and received instructions to show Ruby how to clean the pups with mineral or baby oil and cotton balls. After I showed her a few she began doing that too. I still have to help a little but honestly I don’t blame her for not wanting to lick puppy poop.